Ever wonder why your crabs and seafood taste different when you prepare them at home? That's because crab houses and restaurants have been using J.O. Spice in their kitchens and steam rooms since 1945. Now you can have that same great flavor at home. J.O. Spice Company was established in 1945 and is a Baltimore, MD based manufacturer and distributor of a wide range of seafood seasonings, spices, batters, breadings and soups. 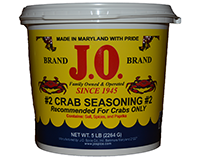 If you have ever eaten traditional steamed Maryland crabs, you have probably already tasted J.O. Spices's famous recipe. The J.O. brand crab seasonings are used in almost every carb house and restaurant on the East coast that serves Maryalnd steamed crabs and is the preferrred crab seasoning around the Chesapeake Bay area. The J.O. crab seasoning is a custom blend using ingredients and a special salt, which is specifically designed to adhere to the steamed crab. A true Chesapeake Bay flavor. Place platform in bottom of large steam pot. Add 1 cup water and 1 cup vinegar or beer for each dozen crabs to be steamed. Sprinkle J.O. #2 crab seasoning over each layer of crabs. Steam until bright red or done.